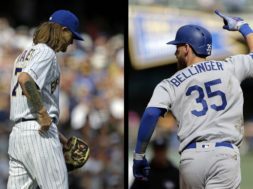 MILWAUKEE (AP) — As Domingo Santana’s towering fly ball with two runners on in the fourth inning carried toward the center-field fence, the crowd at Miller Park cheered, anticipating the drive would break a scoreless tie and give the Milwaukee Brewers a lead. Arizona Diamondbacks center fielder Jarrod Dyson, after breaking in on the ball, silenced the fans when he made a twisting, leaping catch above the wall to rob Santana. With the teams still deadlocked in the sixth, Santana shook off the earlier disappointment and hit a deep sacrifice fly on the first pitch from reliever Jorge De La Rosa to account for the game’s only run. “I put a pretty good swing on it, so I got the job done,” Santana said. Jhoulys Chacin and three relievers combined on a three-hitter as the NL Central leaders slipped past the slumping Diamondbacks 1-0 on Tuesday night. Milwaukee (30-19) moved a season-high 11 games over .500. Arizona has lost six in a row and 12 of 13 — scoring just 24 runs in that stretch. Chacin, making his second consecutive start against the Diamondbacks, pitched five innings. He gave up two hits, walked four and struck out six, including five in a row. Arizona starter Matt Koch (2-3), who allowed four home runs during a loss to the Brewers in his previous start, retired the first 11 batters he faced before giving up a single to Lorenzo Cain and walking Travis Shaw with two outs in the fourth. That’s when Santana came to the plate, only to have a home run taken away by Dyson. Matt Albers (3-1) worked a hitless inning for the win. 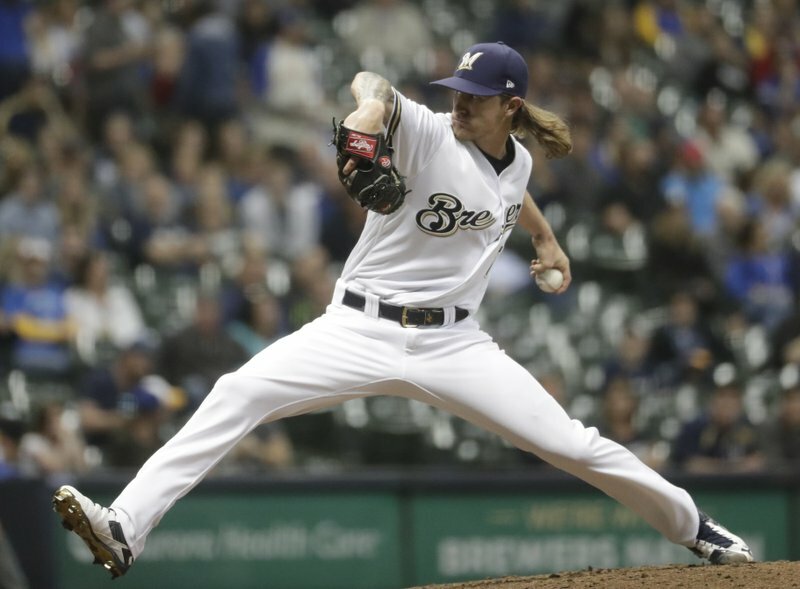 Josh Hader allowed one hit and struck out two in two scoreless innings. Corey Knebel pitched the ninth for his third save but not without some drama. 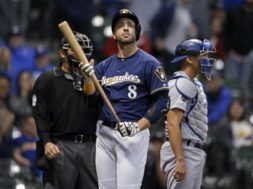 Milwaukee manager Craig Counsell stormed out of the dugout and was ejected by plate umpire Angel Hernandez after Knebel walked Jake Lamb leading off the ninth. Knebel walked off the mound toward the plate while waving his hands and yelling at Hernandez. Pinch-runner Nick Ahmed was caught stealing, Paul Goldschmidt struck out looking and Daniel Descalso grounded out to end the game. The Brewers are 10-2 against NL West opponents this season. With one out in the seventh, Ketel Marte, who was thrown out earlier in the game trying to stretch a single, took off from first base on John Ryan Murphy’s sinking liner to center. Marte had already rounded second as Cain made a diving catch and was easily doubled off. Dyson led off the eighth with a walk but was called out on an attempted steal after he slid past the base. Diamondbacks: Steven Souza Jr. is back on the 10-day disabled list. Souza originally strained his right pectoral muscle during spring training and didn’t start his big league season until May 3. He reinjured the muscle on a throw Friday night against the New York Mets. OF Socrates Brito was recalled from Triple-A Reno. Diamondbacks: Zack Godley is 2-0 with a 1.42 ERA in four games (three starts) against the Brewers. He tossed six shutout innings with six strikeouts on May 26, 2017, in his lone career start at Miller Park. 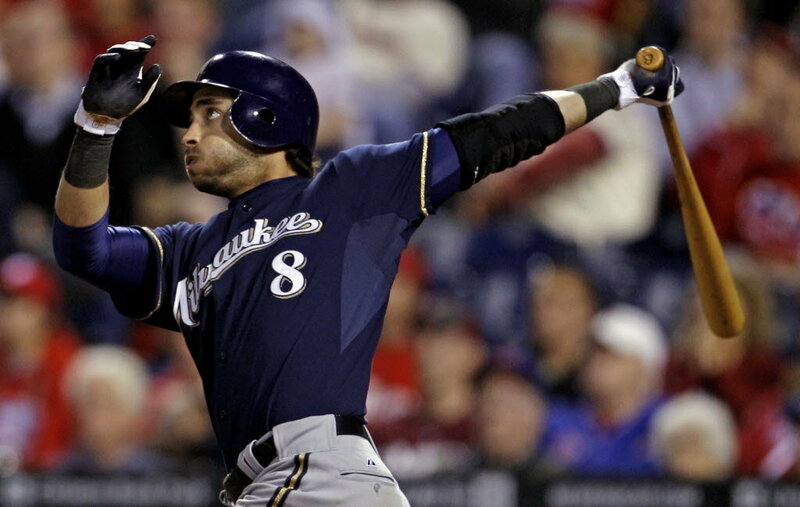 Brewers: Brent Suter (3-3) will make his ninth start of the season and first ever against the Diamondbacks. He has not made a quality start this season.